A major conference for Daoist ecological temples will be held on the Daoist sacred mountain of Maoshan this August. The event will launch the next Daoist Long-Term Plan for the protection of the environment, which emphasises green lifestyle choices and on not buying or using ivory or rhino horn. It will consolidate the Daoist Ecological Temple Network (DETN), and announce plans for it to have a formal headquarters..
ARC, and our long-term partners Valley Foundation and WWF-Netherlands, are supporting the event. Maoshan is one of the most important Daoist Sacred Mountains in China. In the fourth and fifth centuries one of the three major Schools of Daoism, the School of Supreme Purity, was formed there. It also has one of the most important Daoist heavenly grottos. It has been a leading centre of environmental work for over a decade, since the 2008 Daoist Forum in which the MaoShan Declaration on protecting the environment was made. Read the MaoShan Declaration here. Accommodation will be in the stunning new Daoist ecological hotel and temple complex, including . Maoshan means "Grass" or "Thatch" Mountain" and it is close to the city of Nanjing, in Jiangsu province. Registration is on the 17th August, with the meeting taking place on the 18th and 19th, and departures on the 20th. This is a prestigious event for the Daoist community. Temple delegates will come from all over the country. They have already been working together through previous meetings and an online discussion group they have formed to discuss their environmental challenges and solutions. In addition, there will also be members of the Daoist community who are championing for the Daoist Grottos to be included in UNESCO's heritage list. They will report on the status of the application at the event in Maoshan. A revised draft of the new Daoist long-term environmental plan will be announced. This plan will be discussed, and we hope approved, at the China Daoist Association meeting later this year. One of the important new emphases is the specific rejection of rhino horn and ivory. Both are now illegal in China, and the reinforces this, reminding followers that it should not be used either as a status symbol or as a medicinal ingredient, "It is not only against the Chinese law, but also against Daoist teachings." It also includes a pledge for temples to take a pro-active role in education about the environment and humanity's role in nature. Also, nine Daoist Ecological Temple Network centres of excellence in mainland China will be certified and the new headquarters for the Daoist Ecological Temple Network at MaoShan will be announced. In November 2009, the Daoists launched their first long term plan to protect the living planet. Amongst more than 30 faith plans they celebrated the launch at Windsor Castle in the presence of HRH The Prince Philip, founder of ARC, and UN Secretary General Mr Ban Ki-moon who, during his speech, reminded the faith representatives that "You can, and do, inspire people to change". Providing ecological education and raising environmental awareness. including information boards and posters, with the aim that by 2015 there were eco education projects in half of all the Daoist temples. Maximising the ecological benefit achieved from Daoist resources. including planting trees and other vegetation with an emphasis on protecting old and well-known trees and a better general use of green places around Daoist temples. Promoting Daoist ecological traditions and wisdom, to achieve simple living through spiritual reflection. Living daily life with environmental awareness and action. All Daoists should select their daily timetable and food and energy and transport choices according to natural principles. Co-operating with non-Daoist environmental departments. Advocacy and Celebration. emphasising ecological concepts in their traditional festivals, such as the birthday of Laozi and incorporating International Environment Day activities into the Daoist religious calendar. For the full First Daoist Long-Term Environment Plan click here. 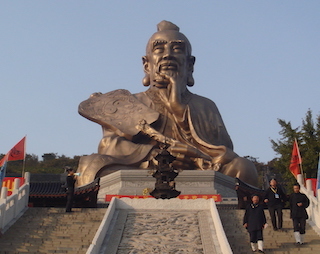 What does Daoism teach us about Ecology?. A major conference for Daoist ecological temples will be held on the Sacred Mountain of Maoshan this August. It will launch the next Daoist Long-Term Environment Plan.